Find out what's on at the Panopticon, and when you can visit this stunning venue here. Opened as a variety hall called Campbell's Music Salon in 1857, a conversion of the first and second floors of a warehouse building. Originally seated around 800 on wooden bench-style seating, with room for around 300 standing. Renamed the Britannia in 1859, and again in 1887 as Hubner's Animatograph. Rebuilt as the Panopticon 1906, and became the Tron Cinema in 1922, before reverting to Panopticon again until closure in 1938. Was used for cine-variety from around 1910, and finally closed as a cinema in 1938. 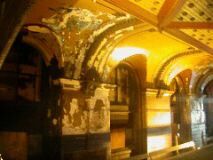 Plans are afoot by the Britannia Panopticon Music Hall Trust to restore and reopen the hall to the public again. For more information on the Britannia, and to join the Friends of the Britannia Trust, visit their website here. In 2009, the frontage was restored (as above photo). The historic clean up was completed under the direction of conservation architect Keith Hamilton of B3 Architects. B3 specialises in museums and listed buildings and includes the restoration of Nottingham Castle in their prestigious list of credits. 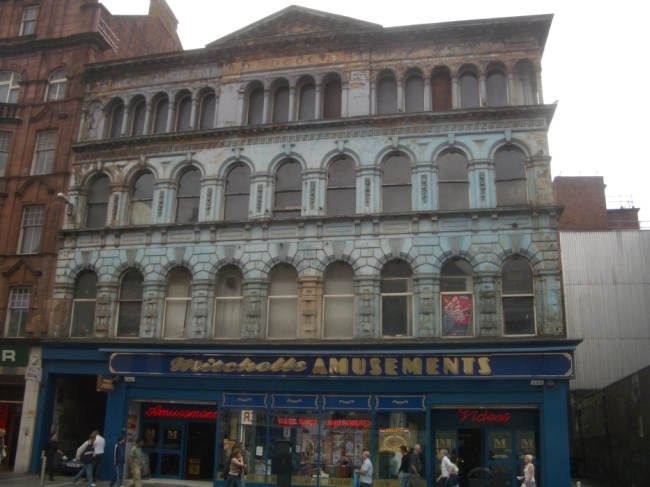 Now the peeling blue paint which had been a familiar sight since the 1930’s, has gone to reveal a magnificent façade which was the original vision of Glasgow Architects Thomas Gildard and Robert H. M. MacFarlane in 1857. In addition to peeling off the blue and repairing the stone some of the original historic features have also been restored and recreated, including the missing Putti (small children – usually boys - which are traditionally depicted naked). The Putti were recreated by sculptor, Jez Ainsworth, who in recent years worked with Hathernware on the restoration of the magnificent Doulton Fountain which has been relocated to the front of the People’s Palace on Glasgow Green. 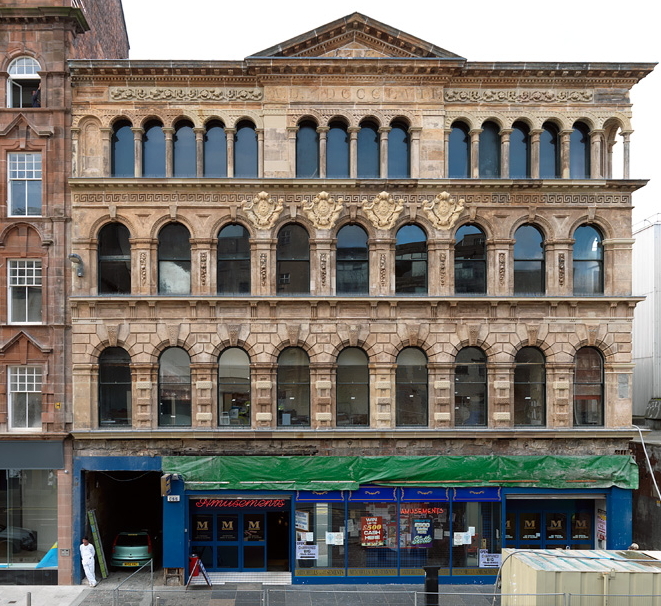 This work was funded by Historic Scotland, Merchant City Townscape Heritage Initiative and the Mitchell Family (the owners of the building) and cost in the region of £900,000. Thanks to the Trust, we were given an opportunity to thoroughly explore the Britannia on 19th Feb 2003. Results are available here. See here for a selection of photos of the interior, taken on a 2002 Doors Open Day tour. A few images here on the occasion of Tony Roper unveiling a framed picture of many of Glasgow's old theatres in 2009. Thanks to Jenny Bann for the images.